Asbestos found in crayons!? Every kid drawls with crayons. In fact, most people learn how to write with crayons. Crayons are used in schools and handed out to children at restaurants to keep them occupied while the parents talk. This year U.S. Public Interest Research Group found tremolite fibers, a type of asbestos, in green Playskool crayons sold at Dollar Tree. Crayons are generally considered non-toxic as printed on labeling. However, young children sometimes eat crayons and parents should avoid those that contain asbestos. Asbestos is a substance that can cause breathing difficulties and cancer if inhaled. 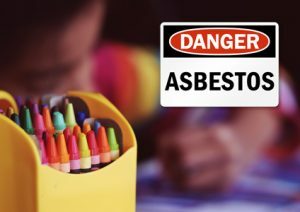 In 2015 the U.S. Public Interest Research Group found Playskool and major brands including Disney Mickey Mouse Clubhouse Crayons and Nickelodeon Teenage Mutant Ninja Turtles crayons to contain trace amounts of asbestos fibers. Since 2015 many brands have cleaned up their supply chain and manufacturing processes except Playskool. Click here to read the original article. Every year the U.S. Public Interest Research Group conducts testing on various back to school products and toys and releases a back to school report. Blue three-ring binders by Jot sold at Dollar Tree tested positive for phthalates, a substance that is linked with asthma, obesity and lower-IQ scores. Two children’s water bottles previously recalled by the Consumer Product Safety Commission for containing lead — Reduce Hydro Pro Furry Friends water bottle, sold at Costco and Amazon, and GSI Outdoors Children’s Water Bottles, sold at L.L. Bean. Despite the recall, a CBS New reporter was able to order the Hydro Pro Furry Friends product from Costco online. A Costco spokesman failed to return a reporter’s phone calls. Be sure to check out U.S. Public Interest Research Group’s full back to school report. ← How does air pollution affect our pets?